Google has also updated the Android version of the Chrome app to version 64. The major change in this version is that the browser will now prevent ads from opening new tabs without your permission. This is slightly different from pop-up blocking, where usually an ad will break out of its iframe, called frame busting, and take hold of the browser navigation and redirect the user to sites where you usually see messages like your device has virus or some other call to action. This new change should prevent ads from taking hold of the browser navigation unless the redirect matches the URL of the current page. Another change is that Chrome has changed its default navigation bar color from black to white. This is likely to prevent burning-in of the navigation bar icons on OLED displays. However, we noticed this change is reflected on very few devices. 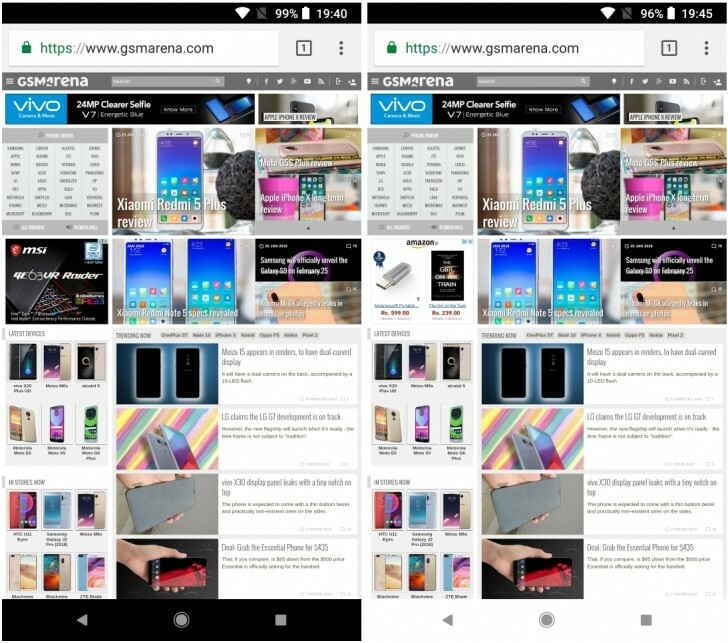 Our Pixel 2 changed to a white navigation bar but our Note8 and OnePlus 5T already had a light colored navigation bar as part of the changes made by their respective manufacturer, so they remained the same after the update. Meanwhile, our Moto X4 unit running Oreo maintained its own custom black navigation bar even after the update. So unless your device uses the stock implementation of the Android navigation bar you won't see this change.